Halloween books have a lot of crafty ideas in them. Here's one of them: paper mache pumpkins. If all goes well, we'll use them for our candy-collecting. Nice and clean and all ready to paper mache. I wish the idea to lay newspaper down would have dawned on me before the project rather than after! 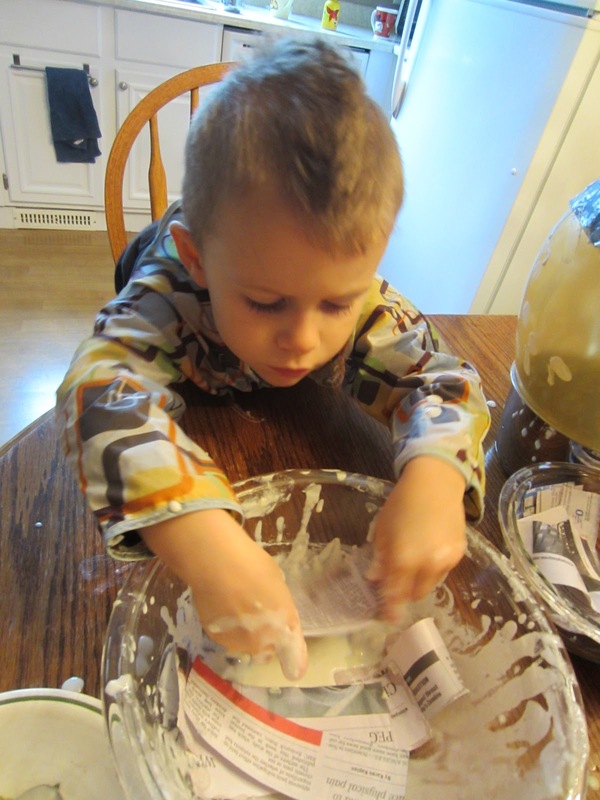 With hands dripping flour and water, Abishai says,"Mommy, this is the best day ever." Which is what he always says when he thinks something is fun. This is a real exercise in letting go for someone like me who likes things clean. The boys painted the pumpkins. I was hoping that we wouldn't be able to see the print after we painted them, but my hope went unfulfilled. Micaiah painted the eyes and nose and I helped with the mouth. Already to collect candy in... We'll see if they hold up.